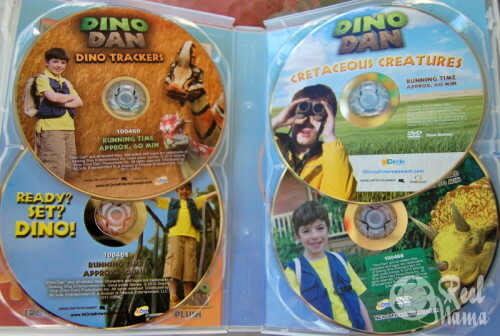 Disclosure: I received a copy of Dino Dan DVD Dino 4 Pack for review purposes. 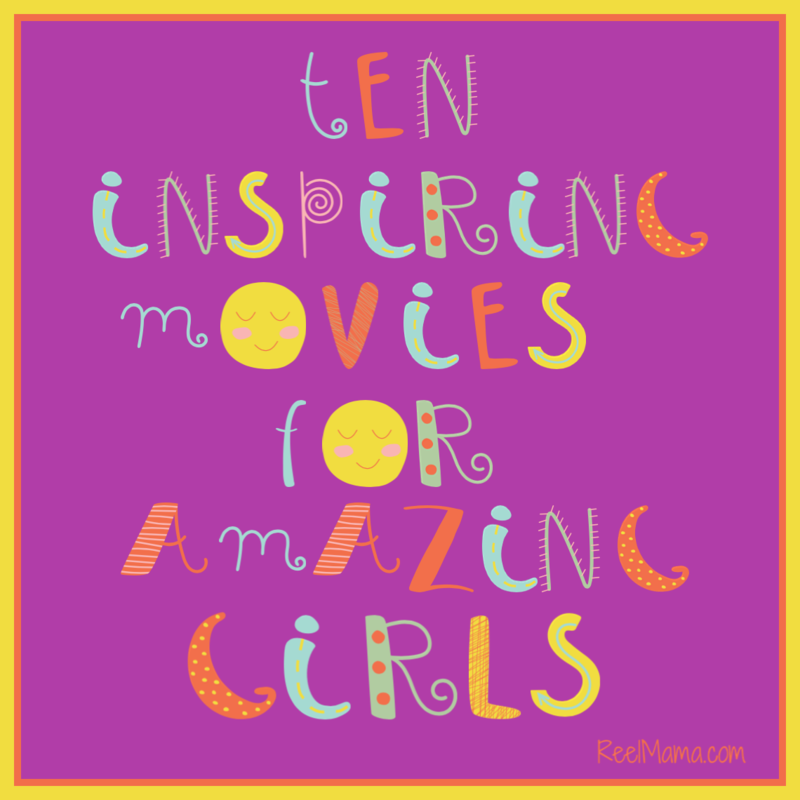 Check out my awesome Dino Dan DVD 4 Pack giveaway here (ends 10/21/13)! The Nick Junior kids TV show Dino Dan is now available in a DVD 4 pack. The show encourages kids to use their imaginations to make learning a fun adventure and introduces fun facts about dinosaurs. * Dinosaurs are extinct, so kids know that, even though they are big and scary, they pose no threat in reality. * Dinosaur skeletons are gigantic, the exact opposite of their much smaller selves, and to them dinosaurs’ large scale makes them cool. Plus, nobody can tell dinosaurs what to do: kids love that. * Kids also love the idea that they might be able to become a paleontologist and discover fossils when they grow up. I think Bob Strauss’ points are very true. The fact that dinosaurs no longer exist is a real point of interest for kids, and I believe it really fuels their imaginations. This concept inspired a series on Nickelodeon called Dino Dan, which is now available in a new DVD 4 pack. In it 10-year-old Dan Henderson (Jason Spevack) is a paleontologist in training, and, using the power of his imagination, he can see dinosaurs, “even though no one else can.” Dan’s favorite thing about his interaction with the dinosaurs is the learning adventure. The series really manages to bring dinosaurs to life in a highly realistic way. They are colorful, and with advances in special effects, the dinosaurs are quite believable. 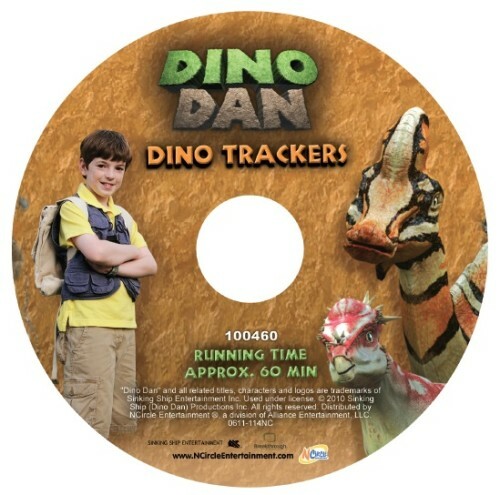 Dino Trackers is Disk 1 in the Dino Dan DVD 4 pack. Each DVD includes multiple episodes, and each disk has a total running time of 20 minutes. Though not on the level of a big screen Jurassic extravaganza, the effects are very good when you stop and consider that this is a kids’ TV show. Many parents might have grown up with a retro classic like “Land of the Lost” to fuel their interest in prehistoric times, and frankly the Dino Dan series leaves all of its TV predecessors choking in its dino dust. I love any kids’ TV show that makes learning fun, and the show incorporates some very fun dino facts into its storylines. For instance, did you know that T-Rex’s teeth were as big a bananas, or that a stegosaurus was as big as 4 minivans, but with a brain the size of a gumball? Dino Dan explains to his little brother that stegosaurus’ brain was so small that paleontologists believe it might have even had a second brain purely in charge of reflexes. Kids eat this stuff up! Kids learn in the series that dinos come in all shapes, sizes, and even colors thanks to Dino Dan’s active imagination. This show will be of special interest to kids ages four to six. Yet kids’ fascination with dinosaurs can start early: my three-year-old really enjoyed Dino Dan and has been working dinosaurs into her imaginary play. Even kids as young as two can appreciate dinosaurs and identify Tyrannosaurus Rex by name. In the series, friends, teachers and family members appreciate Dino Dan’s active imagination. In reality, classmates might not be so kind about such an obsession, but it’s refreshing to see a classroom environment portrayed where all the kids are excited about learning, where science is cool, and where Dan, while maybe a bit unusual, is beloved because the information he shares is so interesting. It’s great that kids can watch this environment portrayed on the show as a way to discover that science really is awesome. 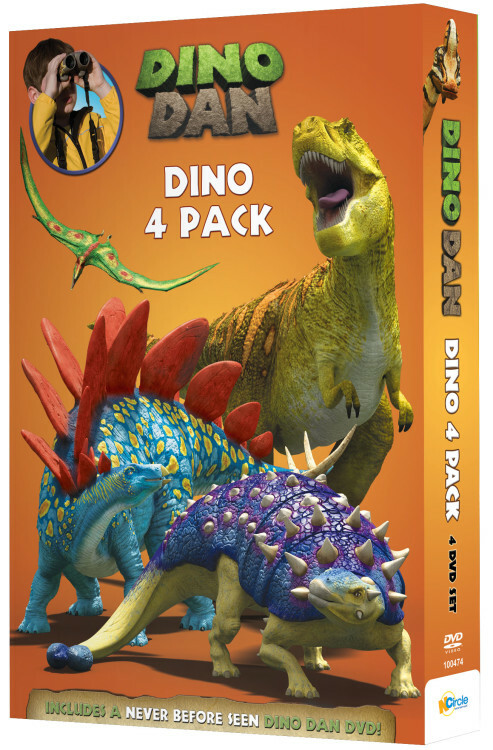 Dino Dan 4 Pack DVDs of the Nick Junior TV show for young children. The show encourages young children to use their imaginations in a scientific learning adventure. Dino Dan is a CGI live action series airing every night on Nick Junior at 5 PM EST. The Dino Dan DVD 4 pack is available at Target, retailing for $24.99. The set includes the following 4 DVDs with multiple episodes on each disk with a running time of 60 minutes per disk: Ready, Set, DINO! ; Dino Trackers; To Catch a Dino! and Cretaceous Creatures! The DVD 4 pack packaging also includes an augmented reality feature that brings dinosaurs to life when scanned. The power of taking a child to a natural history museum to learn about dinosaurs is undeniable. There they can also learn about geology, anthropology, biology, and so much more. They can discover that science is fun, and that learning truly is an exciting adventure. Introduce your kids to dinosaur fun today by watching Dino Dan with them, and then take them on a special family outing to your local science museum, natural history museum, or dinosaur park! Your kids can’t get enough of Dino Dan? Visit the Dino Dan website for interactive Dino Dan games, fun dino facts, Dino Dan apps, and more. Stay up to date on Dino Dan with the Dino Dan Facebook page. You can also check out the Nick Junior Dino Dan website for downloadable coloring sheets, dino-themed recipes, and more. I hadn’t heard of this show yet. It comes on when we are usually eating supper so we must have missed it. It looks like a great educational dinosaur show. I enjoyed reading your report on the Dino Dan DVD collection and it makes people like me want to see and follow along with the DVD’s and these adventures the games on the website are fun and the facts that people can learn about dinosaurs is neat. My son has the biggest smile when this show comes on. He loves it.